With little to no explanation, the world has burned, now dying a slow death. From what we can gather, for approximately ten years until we join the film in present day. The few humans left trudge over nature's remains in search of food and mere survival. Cannibalism has become, for some, the only option. We follow nameless Man and Boy exclusively on their journey - constantly living in fear. This a world where the moral dilemmas of our protagonists are stripped down to being either "the good guys" or "the bad guys". The Road encompasses an other worldly atmosphere. A disturbing re-creation of a post apocalyptic world. Given the elements pulled together by director, cinematographer and production designer, I was blown away by the film's look. A gorgeous, moving artwork on a decaying future world. The few "action" scenes feel perfectly placed. Not intruding on the pace, but unravelling at just the right moments to keep the main journey constantly involving. All the thriller elements in Road I thought were expertly directed. One scene in a mansion provided chilling suspense that rivals anything I have seen in modern horror in a long time. Director John Hillcoat has said his film is not a horror one, but with it’s themes of cannibalism; it delves into the darkest notions of human desperation. That is an exercise in pure horror. Perhaps compared to the novel, it has been toned down, but there is no denying the territory we are in in these moments. Kodi Smit-Mcphee's performance as the boy is possibly the only distraction unfortunately, but I think for a child actor, he does extremely well and as good as probably expected. Mainly, given the intense material too. Obviously, the connection between Man and Boy is the crux of the story and unfortunately, it seemed to lack some depth. Convincing enough, yes, but not earth shatteringly emotional. I still believed in their connection, it just did not move me as much as I'd hoped. In reality, as it is entertained in the film, they are virtually from different worlds. The boy only knowing the one of cannibalism and desperation, while The man once had that normal life. Having a connection that lacks a more predictable, typical father son level of emotion, could possibly be a more apt approach. Viggo Mortensen as The Man, unsurprisingly, excels. Outstanding in breathing life into the character, especially when you consider him in the flashbacks, then in present day as time goes on and finally as his inevitable death looms. His arc perfectly realised, his desperation was gut wrenching in some scenes. It proved to me yet again, that he remains one of the most impressive and important actors of his generation. Of the side players, Charlize Theron, Robert Duvall and Guy Pearce were all excellent in their respective, brief appearances. 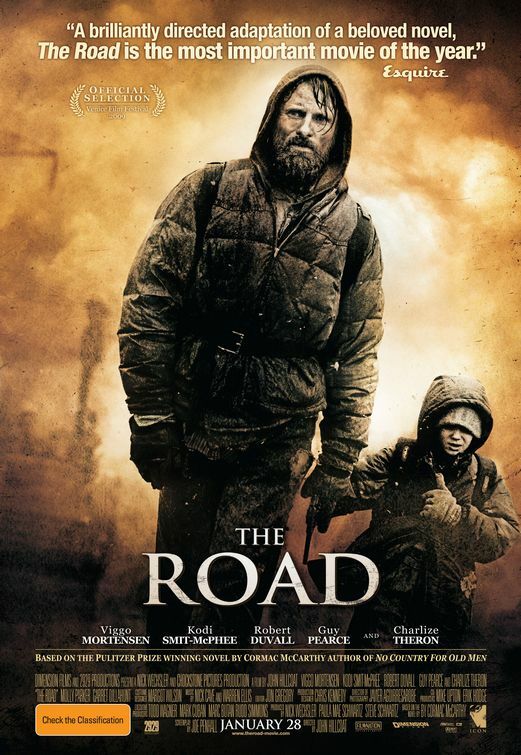 The Road was haunting, suspenseful and poignant. A near masterpiece of the bleak, depressing nature of loss and notion of what would you do? The idea of a post apocalyptic world is one that always brings an intriguing interest, but I felt Road transcended a mere genre tag with it's stunning set design and powerful performances. Nick Cave and Warren Ellis's score I found appropriate and un-intrusive, if not overly exceptional. Finally, though, is it too much to award a film that shows a child being taught to kill himself? Seems to be, but sometimes dwelling in such a dark place is a rewarding and necessary thing.